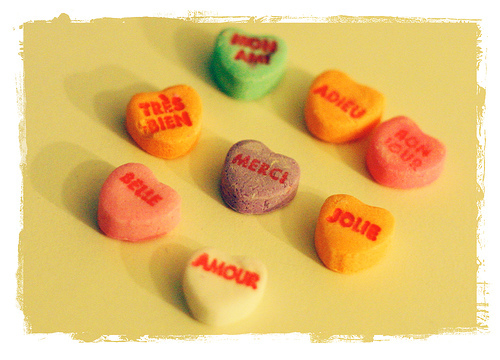 Everyone knows how beneficial it is to children’s brain development when they learn a second language, and so if you are looking for some ways to help introduce French to your children there are some great resources around. Here is a list of our favourite mp3s, DVDs, books, websites, learning systems, and apps that will help you children this beautiful language. Bonjour Les Amis Vol. 1 is a simple 40 minute DVD that is good for kids ages 0-5. It introduces basic vocabulary that isn’t terribly challenging so it’s great for younger kids. French for Kids DVD Set: Simple Words & Number and Colours is a newer DVD with nice modern graphics. The words it introduces are very basic, but serves as a good introduction for small kids. Little Pim French is a pretty good DVD for kids ages 0 to 5. There are six DVDs in the series that include topics “Eating and Drinking”, “Happy, Sad and Silly”, “In my Home”, Play” , “Wake up Smiling” and “I can Count”. The quality of the DVDs are high compared with other language DVDs we’ve come across. They have pleasant music, are engaging (our kids were very happy to watch the entire DVD) and there is the Panda Cartoon with silly segments mixed in with footage of kids performing everyday activities. The segments are arranged in five-minute episodes so you can watch the whole video or just a lesson or two depending on how your child is responding to it. Professor Toto is a DVD that you might want to have a look at for a child who is aged 6-12. With these DVDs you get an English version of the DVD and also a French version of the DVD, so you watch a segment in French, then you replay that same segment in English so the child becomes familiarized with the story. You also get a full script of what is said in the videos in both languages. Professor Toto was released in 2004 so the graphics look modern enough to keep kids engaged. The material is presented clearly and pronounced correctly, it also has a lot of repetition and pleasantly catchy songs. An easy way to get kids used to a new language is to listen to a good CD or MP3. The more the kids hear a language the more open they will be to the language as they get older. A couple of CDs that we have used and really like are Beth Manner’s Fun French for Kids and also the Beth Manners Magic French for Kids. These CDs (or downloads) are really good, because they have a combination of lessons and super catchy songs. Another good Audio CD/MP3 that you could try is French for Kids: Cha, Cha, Cha. This CD has fifteen songs about things like months of the year, numbers, vowels, etc. that are fun for kids. This CD is one of Dr. Toy’s top 10 educational toys for 2012. For older kids a great website to check out is DuoLingo. This is my new favorite language site. It is completely free and there are no ads. It is a sort of gamified way of learning a language. You can set a daily goal that you want to achieve and then you complete a lesson by mostly translating short phrases and answering questions. You can probably do this with a younger child if a parent is going to help the child with the lesson. Since most kids love playing computer games there is a really good free game website for kids called French Games, it has topics, lessons and games. Another fun site with games for kids is this Quia site. If you want even more games you can always try these Play and Learn games. A good site that has general activities and different lesson is this About page that is all about French education. It is very informative and has super useful tips and ideas on language education. Radio Canada’s website has clips and short videos of some of it French language programming, to help your kids get used to hearing spoken language. Mama Lisa has a fantastic selection of French songs for kids, so if you need some free songs for kids this is where you want to go. For basic vocabulary lesson a good site to try is Languages Online. Or another site with a similar setup is Language Guide, it lets kids practice their vocabulary, expressions, the alphabet and numbers. You can listen to all the vocabulary aloud and then test your audio comprehension and speaking skills. YouTube obviously has a great selection of online lessons that your kids can watch, a series or channel that I like a lot for kids is this one from Frencheezee. Kids who know a bit of the language already might like Du Plaisir à Lire. It has games and activities. 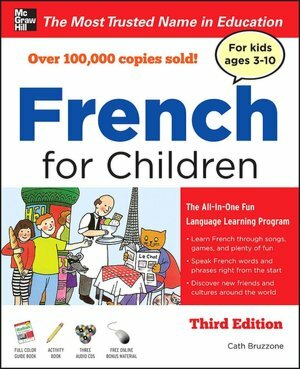 French for Children is a great book that has a mix of written and spoken language. Of all the books that we bought this was the one that our kids enjoy looking at and listening to the most. It’s got fun lessons and quizzes as well the cd is another great option to bring along in the car. The Everything Kids’ Learning French Book The Everything Kids series are always a good investment for most topics that may want to learn about. This book is no exception, it has lot of fun activities that will keep your kids motivated and excited about learning. PetraLingua is an online multimedia language course for kids aged 3-12. They have language lessons with videos. They have some free content as well as paid. You can do this course through DVDs or online. Dino Lingo This is a bit of a pricey course, (around $160) but the idea of it is that it is a fully immersive course so it includes a lot of different materials. The course uses DVDs, books, flash cards, games, songs, and online lessons, so you child can have an immersive experience with lots of different options to help them learn. French Baby Flash Cards has Educational Baby Flash Cards features over 450 high quality images with text and voiceovers. Cost: Free with in-app purchases available. For use on: iPhone, iPod touch and iPad. play2learn French HD COMPLETE lets kids explore words by tapping an item on the screen to hear its name pronounced by the speaker. Cost:$ 1.99 with additional content available as In App purchase – 18 extra sets in 3 bundles. For use on: iPad. Play & Learn French – Speak & Talk Fast With Easy Games includes Game Mode and Learn Mode and has over 700 everyday words and phrases to explore. Cost $2.99. For use on: iPhone, iPod touch, and iPad. There are a lot of good reasons to spend time teaching your children how to speak Russian. It is a language that is spoken by roughly 300 million people worldwide, making it the most commonly spoken Slavic language in the world. Russia is also one of the ten strongest economies in the world and is continuing to grow at a rapid rate, so if your children are able learn the language they will have increased job and business opportunities when they enter into the job market. If you happen to have a child who is dreaming of becoming an astronaut, you might be interested to learn that in order to graduate from NASA’s Astronaut Candidate Program you need to be fluent in Russian as well as English. 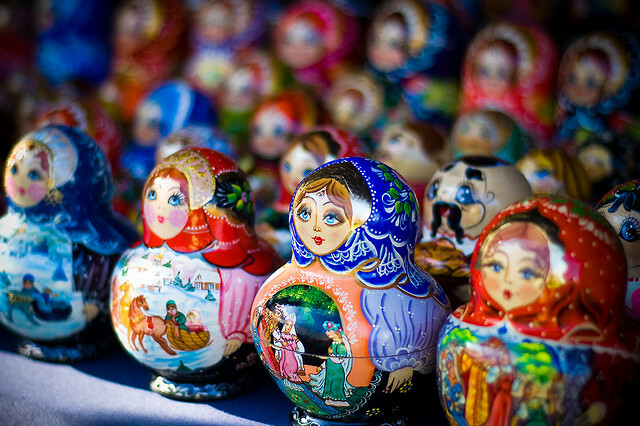 Russia also has an incredible history, rich in culture and traditions, so it is a wonderful opportunity for children to learn about a new country or discover their own family history and culture. Russian is considered a moderately hard language to learn, so luckily it’s not the most difficult language around, although it isn’t one of the simplest either. It won’t be easy, but with a lot of perseverance and practice your children will be opening themselves up to a world of opportunity. A good place to start is with the alphabet, the Russian alphabet is known as the Cyrillic alphabet or Cyrllic script. It is actually easier to learn than the English alphabet because the letters only have one letter to one sound, while the English alphabet can have more than one sound. Digital Dialects has a great section on their site that goes over the alphabet with sound files to help children with their pronunciation. It is a free site with language learning games in Russian (as well as 60 other languages). The Cyrillic script might be a little intimidating for a small child so you will need to be patient with your child as they begin to learn. Once you child is familiar with the alphabet you can begin to introduce basic words like colors, animals, family, things you find around the house. A couple of books that are very helpful with introducing basic words are Usborne’s First Thousand Words In Russian: With Internet-Linked Pronunciation Guide and a series from Milet Publishing called My First Bilingual Book that has wonderful picture books with images for common Russian words that will help get kids started. Raskraska24 is a fun site with activities for kids. Enchanted Learning is an educational website that has games to help learn. Russian Flashcards offer a free account or a premium subscription where you can learn from home with their Flashcard System. As your child begins to build up their vocabulary, you can start to teach them phrases. It is also a good idea to introduce reading the language at this point. Start with simple phrases and once mastered you can move onto more complex phrasing. If you know anyone who speaks Russian try to have your child interact with them, this will help absorb the language much more quickly. It is important your kids are hearing the language on a regular basis. One of best ways for a child to learn a new language is for him to hear people speaking it fluently. 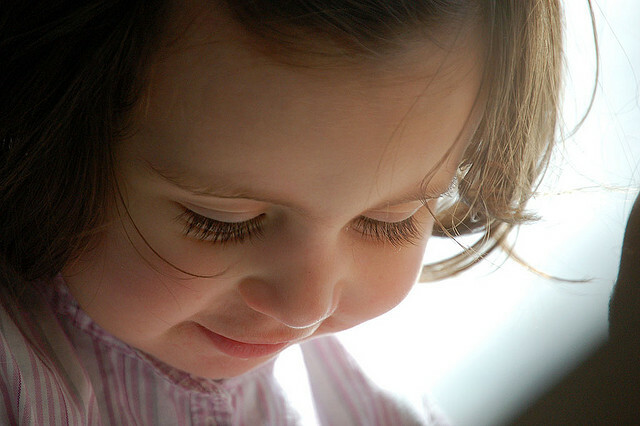 Through conversation children can begin to get used to the sounds and accents of a language. If you don’t speak the language yourself or have someone in your community or family who they can converse with you can always expose them to the language through music and DVD or online videos. Here are a few very popular DVDs that can help parents expose their children to the language. The always reliable Little Pim DVD’s in are a good place to start for children ages 0-5 or check out their digital downloads . For slightly older kids you can try Russian for Kids. This is a 5 DVD set that also includes flash cards and a poster. Another DVD you can have a look at is Bilingual Baby, although we hesitate to recommend this DVD because the reviews for it are a bit mixed. Learn Russian. Basics is an app that teaches kids the basics and fundamentals of the language. This app contains interactive lessons for the alphabet, numbers, seasons, weekdays, months, animals, and colours. Russian Baby Flash Cards is a flashcard app with categories for food, animals, transportation, numbers, colours & shapes, clothing, household items, body parts, outdoor items, music instruments/arts & learning. My First Bilingual App this iPad app features 26 mini-games all with a feature word. You can try the first 10 words for free and then use the in-app purchase to unlock the complete version. This app can best be described as a fully interactive, bilingual board book. Smart Speller Russian HD Full Version helps kids learn to spell by hearing the sound each letter makes, and the proper pronunciation of the words. 123 Count With Me in Russian! was developed for kids (ages 2+) and aimed at teaching them to count by having the child move graphics of toys and shape puzzles. Remember that teaching a new language to a child is a process, and will take a long time so don’t expect immediate results. The more you can expose your child to the language the easier it will be for them to learn. 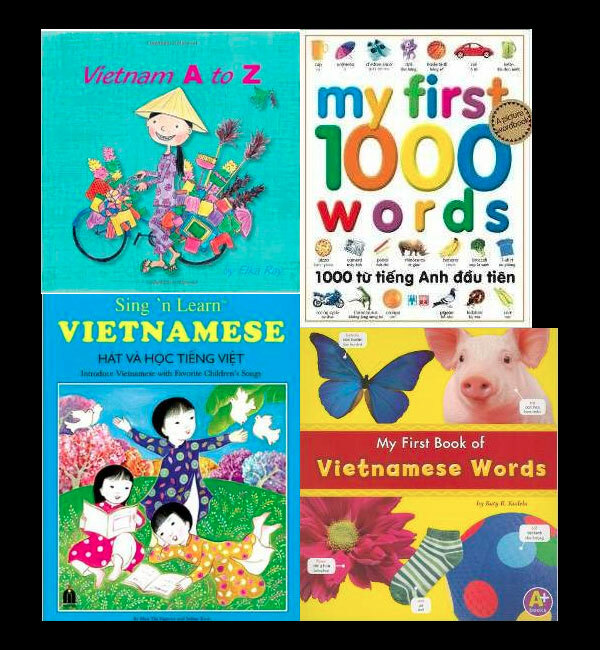 If you are a parent who wants to teach your children a bit of Vietnamese but aren’t sure where to start, we have found lots of great books, apps, language learning systems and some free games that will help your kids learn a bit of Vietnamese in a fun and stress-free way. Since Vietnamese has six different tones it can be a bit difficult to learn, so the more material that you can expose your kids to, all the better. Unfortunately, there aren’t as many resources for Vietnamese as some of the other languages that we have covered, but there is still lots of great stuff that can help parents at home. On the positive side, Vietnamese is based on the Roman alphabet (like English) so some people consider it one of the easier Asian languages to learn. If you are looking for a DVD based language learning system you can try Dino Lingo Vietnamese for Kids. This set has cartoon dinosaur characters that introduce the most common 200 words and phrases in Vietnamese. You can view a preview of the Dino Lingos DVD to get idea of what it is all about. Basically the 5 DVDs are broken down into different subject matter (counting, eating, playing, action, learning). Dino Lingo DVDs are generally very popular and well-reviewed. Since there isn’t really a lot of choice as far as language systems for kids in Vietnamese, this is definitely material worth considering for kids ages 1-7. For total immersion DVDs Mandy’s Moon has a great selection of Vietnamese DVDs for children. When teaching your children a new language at home you should invest in a good picture dictionary like 1000 First Words Vietnamese or the Words 1 Vietnamese/English Children’s Bilingual Picture Book (there are two other books from the same publisher in this series one about the body and another covering shapes and colors.) It’s great for kids to have a reference book that they can go back to if they are wondering about a particular word. If you want a book that has both English and Vietnamese, and can teach children a little bit about Vietnam a very popular book is Vietnam A to Z. This book is great because it introduces the Vietnamese culture in a fun and silly way. Listening to songs in another language is an easy way to get kids to learn basic vocabulary and pronunciation. A good resource with songs in Vietnamese is Sing ‘n Learn Vietnamese Book with Audio CD. This set has 14 songs and melodies that children will enjoy listening to. Another way to help children become familiar with a new language is to find stories or books that your child already knows and read them in another language. Language Lizard is a site that offers dual language books for popular titles like Dear Zoo or The Wheels on the Bus, which just means that each page of the book includes Vietnamese and English text on the page. The publishing company Milet has a huge series of bilingual books in English – Vietnamese with subjects like sports, numbers, music, opposites, animals, fruit, vegetables, home, jobs, colors and more. Most of the books are available on Amazon or directly through their website. On the Milet website you can purchase a 10 book set, which would probably be pretty handy. Digital Dialects has games for learning numbers, colours and vocabulary in Vietnamese. Hello World This site is a little confusing to use, but it does have some good material including conversations, songs, a dictionary, games and lots of other things. 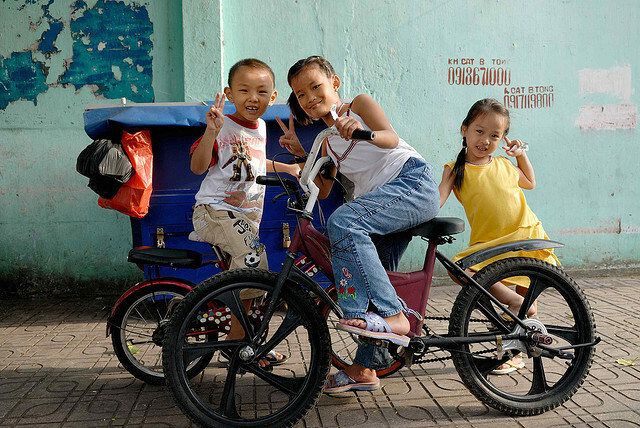 Vuontre is a cool Vietnamese children’s web site. Not for beginners. Apps are a fun and easy way to help kids learn a new language without them realizing they are learning something useful. Luckily there are some apps designed for kids that will teach them a bit of Vietnamese. Vietnamese-English Language for Kids has interactive audio flashcards and games in categories such as animals, basic human anatomy, colors, all with pronunciation from a native speaker. Gus on the Go has Gus visiting the cities of Hanoi, Da Nang, Nha Trang and Ho Chi Minh City and going over how to how to properly pronounce vocabulary words in the following categories: animals, food, transportation, clothes, numbers, colors, parts of the body, and shapes. I can’t find any free lessons to help teach kids Vietnamese, but there is lots of material for beginners that (with the help of an adult) are also okay for kids to use. Learn Vietnamese are some good online video lessons that are simple and short and cover most of the basics. VietnamesePod101 is a very slick website with lots of audio and visual lessons as well as well flashcards and lots more. Vietnamese for Beginners has free online videos that cover the Vietnamese alphabet, pronunciation, tones, basic grammar and vocabulary. Let us know if you have any Vietnamese resources that you use with your own family, we would love to share them with others. Brazilian Portuguese is a great language for kids to learn. Since Brazil is Latin America’s largest economy and it is the 5th largest country in the world by both land area and population, knowing Portuguese could potentially be a really good job skill for your kids in the future. Or if you or your kids love to travel, the climate in most of Brazil is tropical and the 2014 World Cup and 2016 Summer Olympics are being held in Brazil, so learning a bit of Portuguese could be a wonderful excuse for an upcoming trip. With this mind we have gathered up the best DVDs, language systems, free online games, apps and books that can help parents teach their kids some Brazilian Portuguese. For resources to help kids learn European Portuguese have a look at our European Portuguese post. Super Baby Music is a good choice if you are looking for a Baby Einstein type video, but in Portuguese, then this is a good one to try. It is a DVD that is in Spanish and Portuguese. There are other titles in this series including Super Baby Music, Super Baby Animals, Super Baby Colors, and Super Baby Shapes. Little Pim Portuguese Complete Set is a great option if you are looking for a DVD for kids ages 0-5 .These videos each start with a short animated cartoon featuring a panda followed by live-action footage of children doing everyday activities. The box set it introduces over 180 words and phrases for everyday activities. DVDs are themed on “eating and drinking, “wake up smiling” and “playtime”. You can see a preview for it here or use their digital downloads. Bilingual Baby is another DVD that is made for babies to help expose them to a second language. It has over 60 words, phrases, sentences, and manners. The child only hears the Portuguese language, but there is small on-screen text in English to help parents. Portuguese for Kids is a DVD based learning system that includes CDs, books, posters and flashcards for children who are learning Italian. It isn’t cheap ($100+) but it is generally very well reviewed. You can see a preview of it here. Discovery Kids Brazil is a Brazilian TV station for kids. They have a great website that has lots of games and activities. Smart Kids Brazil has educational games, coloring pages and classroom activities. Hello World Portuguese is a free online Portuguese-English dictionary. Disney Brazil is the Brazilian Disney homepage. It has some fun games and videos for kids. Digital Dialects has lots of simple games that will help kids learn Portuguese basics. Learn Portuguese has 9 games designed to teach Portuguese vocabulary and conversation skills. You can download the first lesson for free and if you like it you can upgrade to access all 50 lessons and 40+ hours of content. Gus on the Go: Portuguese for Kids helps kids learn basic vocabulary concepts with interactive visual and auditory lessons on numbers, colors, shapes and more. Each lesson review unlocks a vocabulary game that reinforces what your child has learned. Portuguese for Children contains over 400 commonly used Portuguese words including colors, numbers, food drink and animals, all illustrated and professionally recorded by a native Brazilian (Portuguese) speaker. Hippocrene Brazilian Portuguese Children’s Picture Dictionary is suitable for ages 5 to 10 years. It is a picture dictionary that features 625 entries, each accompanied by a large illustration. My First Book of Portuguese Words shows kids how to pronounce simple Portuguese the words correctly. It has colourful photographs and simple labels that are easy for kids to read without being overwhelmed. 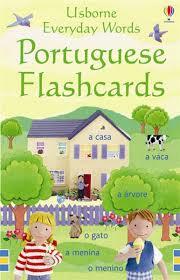 Millet Publishing has a number of Portuguese books for kids that are Brazilian Portuguese. The publisher told me these books are Brazilian Portuguese but at least one review said that at least the Picture Dictionary is European Portuguese so you may want to check your local library to see if they have any of these titles before you purchase them. Brazilian Lullaby has traditional songs, well-known Brazilian instrumental music, and original compositions that makes a nice mix of lullabies and songs for kids. Brazilian Playground is part of the very popular Playground series of CDs. This one has a great mix of Brazilian music for kids. If you are a parent who is looking for resources to help teach your kids Portuguese you may have run into the problem of only being able to find materials for Brazilian rather than European Portuguese (as spoken in Portugal). This can be a frustrating experience, especially if you buy a book or a video only to find out that it isn’t what you wanted. So in our quest to try to find the best teaching tools for kids, we have come up with what we hope is a definitive list of DVDs, books, apps and websites that you can use to help your kids learn (European) Portuguese. 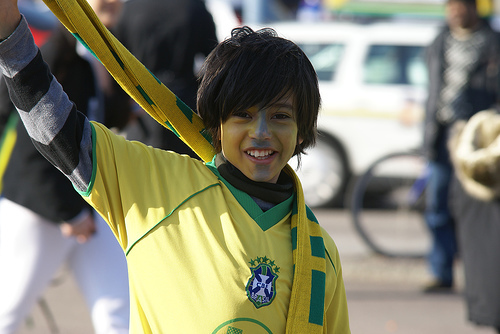 *For materials for learning the Brazilian language go to our post on Resources to Teach Kids Brazilian Portuguese. There aren’t a lot of choices as far as language systems to teach kids European Portuguese. The only kids system that we are going to recommend is Dino Lingo’s European Portuguese for Kids. The Dino Lingo system is generally very well reviewed and a good choice to help kids learn a second language. This kit has language learning DVDs, CDs, books, posters and flashcards. You can watch a preview of the DVDs here. If you aren’t interested in the Dino Lingo system you can try the Muzzy language learning system, but the Muzzy system has very mixed reviews so you should probably read some of the reviews and watch the previews of it if you are thinking of purchasing it. If you are looking for a fun website for kids try Disney’s Portugal Site it has games and clips of shows and movies with favourite Disney characters. An easy way to expose children to a new language in a fun way is through online games. There isn’t a huge selection of European Portuguese games for kids but a good site for games is Digital Dialects. It has lots of simple games that will help kids learn the basics. Another great site to check out is Jogos Didaticos. It also has some fun and easy games for kids. Another great way to help children reinforce second language skills is by making it fun with an app. 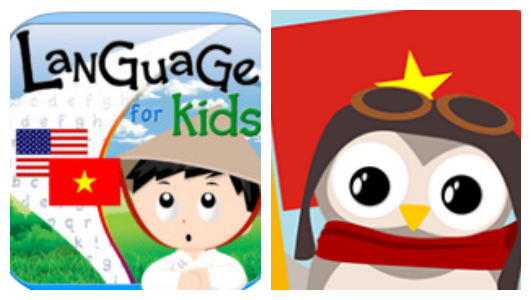 Here are a couple of language apps that are great for kids. iPlay Portuguese: Kids Discover the World lets kids listen to animated pictures of 500 words to hear the correct pronunciation then they record themselves to see how well they can pronounce the words. It also has 30 quiz games and 600 quiz questions. My First Words in Portuguese SD teaches children from 0-5 how to correctly pronounce the most important words in using images, colors, animals, music and voices. It has more than 40 minutes of video with topics including family, fruits/vegetables, animals, colors, food, nature, face/body, baby items and transportation. First Thousand Words in Portuguese by Heather Amery and Mairi MacKinnon is picture dictionary that has 1,000 everyday words combined with pictures. It also gives a link that contains an online pronunciation guide through the Usborne Quicklinks website. Salpicos is basically a student text book that teachers can use to teach Portuguese to kids. If you get the students book (rather than the teacher book) it has a CD that contains children’s song. The level one student book is aimed at 4 to 5 year olds, and focuses on listening to stories, singing songs, looking at images etc. “Salpicos” 2 and 3 are for children who have started reading and writing (6 to 10 year olds). Falas Português? is another text book for teachers who are teaching kids, but it can also be used by parents as well. It has 10 units that include exercises and activities (stickers, grammar notes, pages on culture and traditions etc…). The student book also contains an audio CD. There are lots of books that you can use to that are available with translations although you will need to confirm that it is European Portuguese rather than Brazilian. Language Lizard has bilingual books that are all European Portuguese. If you are looking for flashcards that are a good way to re-enforce a new language you can try Usborne’s Everyday Words Flashcards. This is a pack of illustrated cards with fifty simple words. Each card shows an everyday object with accompanying word on one side and just the word on its own on the other to aid revision. The cards can be used to play games, for self-testing, or simply propped up around the house or classroom as useful reminders. 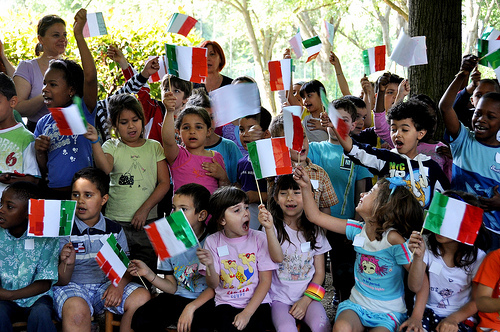 There are so many good reasons to teach your kids Italian; they will have lots of people to talk to since more than 80 million in the world speak Italian, it is a beautiful language to be able to speak, and if your kids learn Italian then that will give you a good excuse to visit Italy and enjoy all the wonderful things that Italy has to offer. So with that in mind, we have collected lots of fun and easy resources that parents can use to help teach their kids Italian. An easy way to help kids learn a new language is from watching a native speaker in a simple and fun way on a DVD. Here are a few DVDs and DVD based language learning systems that can teach kids a bit of Italian. Italian for Kids: Language Box Set (Vol. I) is the Little Pim DVD series that uses immersion and interaction techniques to create to help kids ages 0-5 learn Italian. Each DVD teaches more than 60 new words and phrases arranged in five-minute episodes. Early Lingo Italian is a 6 DVD Series that gives children ages 6 months to 6 years a solid foundation in a second language through an animated and live-action adventure series. The topics include colors and shapes at the park, numbers and counting at the farm, opposites at the beach, alphabet at school, at the market and in the city. With approximately 210 minutes total running time and over 450 words and phrases, the set will give your child a solid foundation in Italian. Italian for Kids – Learning Italian for Children is the Dino Lingo’s DVD based learning system that includes CDs, books, posters and flashcards for children who are learning Italian. It isn’t cheap ($100+) but it is generally very well reviewed. You can see a preview of it here. Italian for Children: Professor Toto Language Education Kit – Italian Version is a total immersion DVD set that also includes 4 animated DVDs, 2 audio CDs, 2 activity books and 3 reference books. You can view a preview of the DVD it here. You can buy the DVDs separately or the kit for around $200. Ciao Bambolini is a DVD that teaches children the basic language, art, food, culture and music of Italy. You can watch a short trailer for it here. 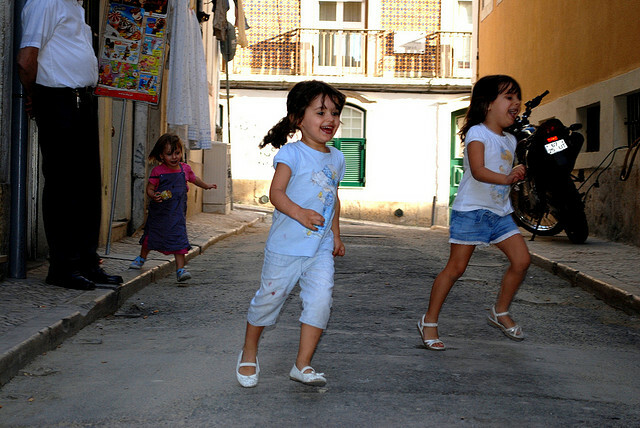 • Purpose Games has a wide range of simple Italian games that are good for kids. • Digital Dialects has lots of simple games that will help kids learn Italian basics. Learn Italian by MindSnacks has 9 games designed to teach Italian vocabulary and conversation skills. You can download the first lesson for free and if you like it you can upgrade to access all 50 lessons and 40+ hours of content. Learn Italian Baby Flash Cards is a free app that has over 450 high quality images with text and voiceovers. There are additional real sounds where applicable (such as a lion’s roar or an ambulance siren) to enhance visual and auditory learning and memory simultaneously. Parents have the option to turn voiceovers off during parent-child learning session and turn voiceovers on when the child is self-learning. They can enable Question Mode to display 4 images and ask the child to click on the right answer. Complexity of words is perfect for ages 1 to 4. Categories include: Food items, Animals, Alphabet, Transportation, Numbers, Colors & Shapes, Clothing, Household items, Body Parts, Outdoor items, Music Instruments/Arts & Learning. Lightning-Fast Italian for Kids and Families: Learn Italian, Speak Italian, Teach Kids Italian is a good option for parents who want to teach their kids Italian but don’t speak Italian themselves. This book shows parents ways to incorporate Italian into everyday activities, so children can learn Italian while doing the things that are common at home. Let’s Learn Italian Picture Dictionary introduces beginning language learners to more than 1,550 commonly taught basic Italian words displayed in 30 two-page spreads that illustrate the meanings of words. The images focus on scenes familiar to children aged three through eight, such as home life, the classroom, city life, sports, the zoo, etc. This picture Dictionary also includes an index and glossary of all the illustrated words in the book. Italian for Children, Third Edition (Book & CDs) is a fun and effective way for your child to learn the Italian language and culture. This program has a full-color illustrated guidebook that features cartoons, characters, and fun facts. It also has two audio CDs that guide your child through the course and teach language through a combination of Italian-language songs, games, and activities as well as and activity book. Mama Lisa has a fantastic list of Italian songs for kids. 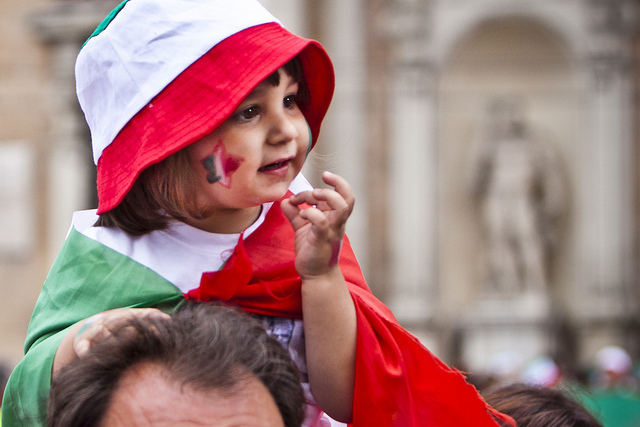 If you have any useful resources to help teach kids Italian let us know in the comments below.